2013 has been a year of many changes in the Background Check industry. Issues like “Ban the Box”, “full disclosure” requirements, and recent court rulings looking to curb the reach of the EEOC have filled the news. These changes have been driven by the EEOC (Equal Employment Opportunity Commission). They have made no qualms about making it their mission to end what they perceive to be inequities in using background checks when hiring. The EEOC has focused their efforts on ending the “disparate impact” that they claim background check policies have on minorities. The first step in reaching that goal has been “Ban the Box”. It has gained widespread popularity, with many states already adopting legislation in its favor. The gist of it is the call to remove the question of whether an individual has a past criminal record from the initial application. It is only after a conditional offer of employment has been made that an investigation into possible past criminal activity can then be made. The hiring company is also required to conduct the criminal background check under “full disclosure”. All conditional employees must be made aware that an investigation is being made and what their rights are if a record is found that may impact their eventual employment. The EEOC is adamant that companies rethink their process and be very specific about the kind of criminal activity that would prohibit hiring the individual. Merely having a criminal record is not enough. The employer needs to take into consideration the crime, how long ago the crime occurred, and whether the crime would keep the individual from safely performing the duties required in the specific job for which they applied. Many believe that this puts companies in a difficult position. The Attorney Generals from several states have criticized the EEOC saying that their policies put companies that use background checks during their hiring process in a Catch 22. On the one hand they fear being sued by the EEOC, on the other they risk hiring employees that are unsafe to either their company, their existing employees, or their customers. Recently, however, there have been court decisions that put the EEOC themselves in the cross hairs. A Maryland federal court ruled in favor of a company sued by the EEOC for their background check practices. This company had been experiencing an issue with employee theft, violence, and drug use. To combat this, the company established a new policy requiring criminal background and credit checks on prospective employees. The EEOC stepped in and sued the company for the “disparate impact” of their new policy. Despite the EEOC’s use of two expert witnesses to support their claim, the court ruled in the company’s favor. Citing the difficulties businesses face in hiring safe employees and the lack of evidence from the EEOC really proving “disparate impact”, the court granted a summary judgment for the company. However, the 2013 filing of high profile cases against BMW and Dollar General Stores shows that the EEOC is not backing down on the issue of background checks in the hiring process. This issue remains important and, in turn, companies need to pay attention. I believe the effect of the EEOC’s guidelines is lessened for companies that already have a fundamental belief in doing the “right” thing. 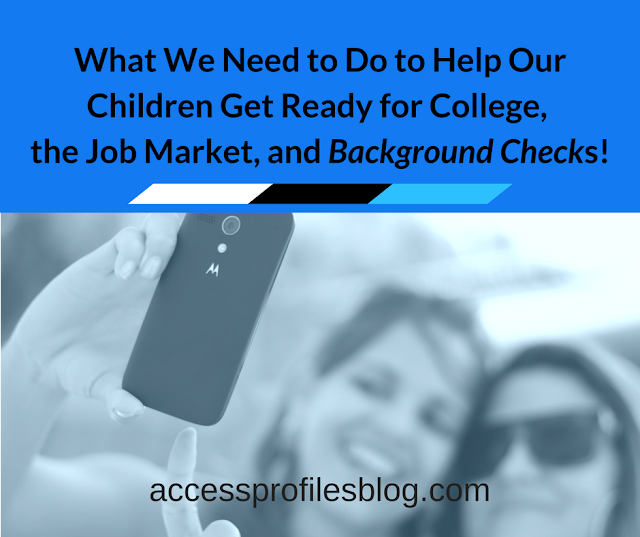 Companies that focus on operating in the light of day by making sure every applicant is fully aware of their hiring process and their rights to dispute any inaccuracies found during the background check are ahead of the game. It is entirely possible to believe in “second chances” and still use background checks to protect your company. Using verifications to hire the best candidate should be the right of every business owner ~ as long as they keep in mind what is fair. This should be the goal of every business, and not simply because the EEOC says so! I would also like to wish you, my faithful readers, all the best in 2014. May you achieve your goals and remember to keep reaching for the stars! Happy New Year! For continued tips and information to help you succeed in your Small Business, take a moment subscribe to my blog and check out my website. Thanks! And if we are not already connected, visit me on Google+, Facebook, Twitter, and LinkedIn. I would love to start the new year getting to know you! 5 Things That Have Made Running my Business Easier in 2013! With this year rapidly coming to an end, I have been thinking a lot about the “little” things that have made running my business a whole lot easier this year. Each has, in their own way, made me more efficient, organized, and creative. Since any given week you may find me in Pennsylvania, D.C., or traveling, the key has always been finding tools that allow me to easily run my business from anywhere. Additionally, I have found that since increasing my social media presence, I also needed to find ways to streamline that process. It was crucial to free up the time necessary to do both my “regular work” and not drop the ball online. This past year fulfilling those two needs has been my quest. Many of you already know I consider myself “technically challenged” so, no matter what, anything I considered had to be extremely easy to use and still make a big enough impact to get the results I desired. My MacBook Air ~ I honestly can’t take the credit for this “find”. It was a Christmas gift from my husband last year. And even though I protested the cost (I had previously used much lower priced laptops), I absolutely love it! The biggest advantage has been its light weight and long battery life. Both make it extremely easy for travel or working where there is not a readily available outlet (think sitting on a hotel balcony looking at the ocean!). Calendar & Notes ~ Both were already loaded onto my MacBook and each have really made an impact. With Calendar it is easy to keep track of upcoming appointments and deadlines. I love the reminder feature that pops up the day before and day of any event I have scheduled. I have found Notes to be a great organizational tool. When I find an article I want to either read later or share online, I simply copy the link into notes and am able to access it when I have time. I also use it to jot down quick blog ideas or “things to do”. I find myself adding to Notes many times during a work day. Hootsuite ~ Hootsuite is probably the single most effective tool I found this year. Prior to using it, I was going on each social media site individually to schedule posts. Now that has changed. I love the ability to easily pre-schedule posts to all my sites right in Hootsuite. It is also nice to be able to take a quick look at what is going on in each using the streams. While there are many other features available in Hootsuite, I have yet to use them....maybe next year. For right now, this is what works for me. Paper.li ~ Through the creation of my weekly online paper, “Access Profiles Weekly”, I have been able to reach more readers for my blog and for the articles I share from others. The best part is that it takes very little additional time for me to generate each edition. At the suggestion, and with the help, of Joe Soltis of Soltis Consulting, it was easy to set up my existing blog and tweets as the content feed for my paper. In this way, articles are published in my paper with no additional work from me. Perfect! Guest Writers on my Blog ~ While this is not a “tool”, sharing the blog posts of others has been wonderful. It not only allows me to post more often to my blog, it also gives me a chance to “pay it forward” to other bloggers. A surprising benefit has been the creative boost it has given my own writing. I find reading the interesting thoughts of my guest bloggers jump starts many of my best ideas. Looking ahead to 2014, I have placed Mailchimp on deck. I have yet to learn a lot about it, but I like that it is an easy to use tool to ramp up email marketing. I have done very little to date to use email effectively, so this is definitely something I will look into. I am also planning on using Pinterest in some more creative ways. While my business does not easily lend itself to such a “visual” medium, I will try and create images of my services and turn customer testimonials into pins. 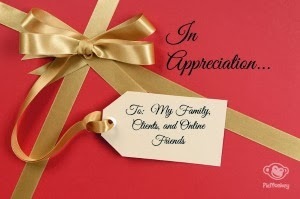 As a bonus, I would also like to add that the help of my family, clients, and online friends has not gone unnoticed. My family has always been supportive and understanding of my weird hours and oftentimes pre-occupation with work. Without them, I would not have the freedom to pursue my goals. I have also enjoyed considerable encouragement and loyalty from my clients. This past year has brought new ones into the fold, and for that I am grateful. Each customer, new and old, renews my sense of purpose. And finally, my Online Friends. They have acted as my cheerleaders, mentors, and sounding boards. Some have even lent me their skills. Most importantly, all have made it much easier, and definitely more fulfilling, to run my business. I can’t wait to see what happens next year! If you would like tips to help you jump start your business in 2014, subscribe to my blog and check out my website. Let’s also connect on Facebook, Twitter, Google+ and LinkedIn! Thanks! Holiday Hearts for Vets ~ This Week’s “Small Business Spotlight”! In this season defined by giving and gratefulness, many charity organizations look to make things a little brighter for those around them. Holiday Hearts for Vets stands out among the crowd. This organization, located in the Rockbridge county area of Virginia, is focused on giving thanks to our disabled, aging, and other deserving veterans during the Christmas holiday. 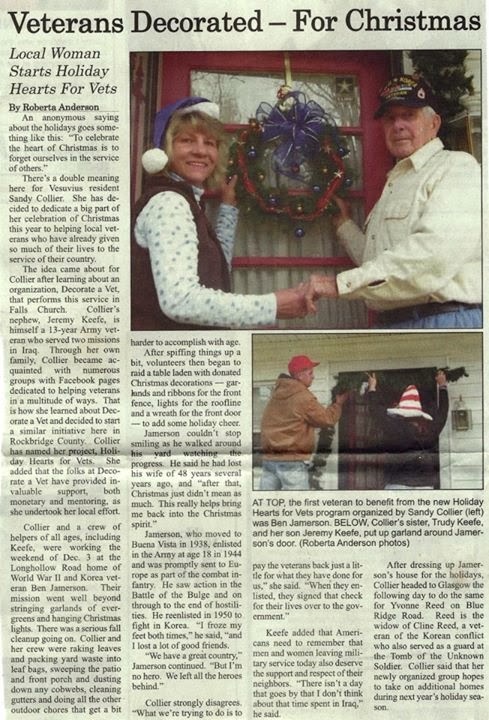 Sandy Collier started Holiday Hearts for Vets in 2011. Helping bring holiday joy to veterans and their families is close to her heart. Holiday Hearts for Vets is Sandy’s chance to “pay it forward”. HHFV honors the sacrifice made to our country by veterans and their families. So, what better way to celebrate the season than to combine the spirit of Christmas and gratitude to our veterans? Sandy even hopes to expand the program to include veterans in neighboring Augusta county. Sandy finds local veterans and fills them in on the Holiday Hearts for Vets program. If they agree to take part, the real work begins. Sandy and her corp of volunteers will clean up the yard, rake ~ whatever it takes to get it ready for the fun part ~ decorating! HHFV will then set to work making the veteran’s house festive. Lights and other decorations donated by local businesses and individuals are used to make their home sparkle. The veterans also receive other “goodies” such as gift baskets and gift cards. Then, come January, the volunteers return to take it all down and clean up. Sandy has many volunteers who participate, whether it is for yard clean up, knitting hats and scarves, baking cookies, assembling gift baskets, and even local stores and restaurants that donate gift cards. Sandy’s hope is that by decorating their home for the holidays, each veteran will know that there are people who care about their sacrifice. It is especially important to Sandy to return the Christmas spirit that some veterans may have lost. This year, Holiday Hearts for Vets is helping three area veterans. All three served in the US Army. However, each year it is different. Since its beginning, Holiday Hearts for Vets has helped a total of 7 Veterans. Their goal is to always strive to do better and improve upon the preceding year. Penny Perasso of Grey-Wolf Designs donated her talents to create a wonderful new logo. Check the logo out at the beginning of this article! HHFV also had help from Miller Finch of Miller Finch Media in helping to write a letter for a recently featured newspaper article. They also thank Joe Soltis of Soltis Consulting for setting up their non-profit status. New this year is Holiday Hearts for Vets Christmas Cards for Troops program. Central Elementary in Lexington, VA., was picked to help get the cards to our soldiers. They helped send over 500 of them!!! 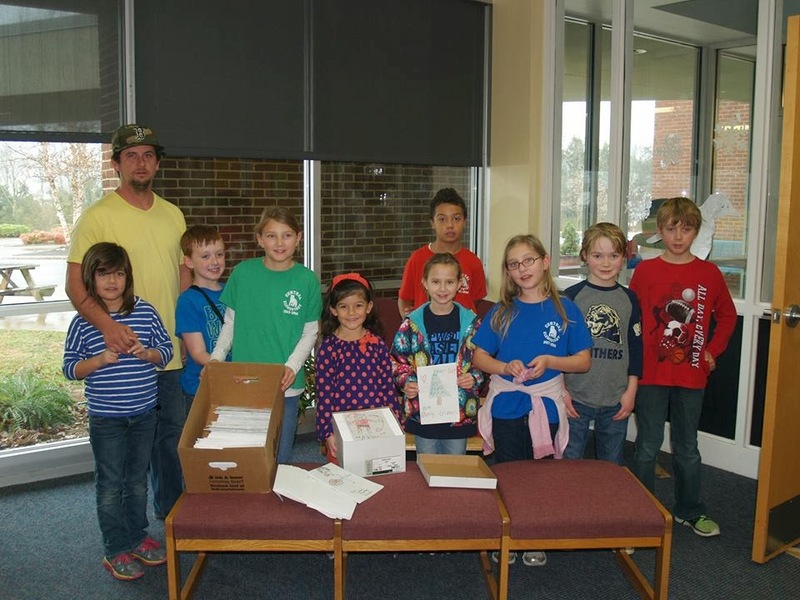 Central Elementary Students Help Send Cards to Our Troops! Sandy gives credit to Jacinta Jacfred Creation Stationary for helping her make the connections necessary for getting the cards. A generous paper company donated all the cards, but they wish to remain anonymous. Also, this year the local Waynesboro, VA Home Depot donated the decorations needed. Sandy hopes this will be an ongoing thing as the need is great. HHFV also thanks Michael Camden Landscaping and LawnCare for jumping on board to assist with clean up. Sandy’s hope is that in the coming years they can get a construction company to donate their time and skills to our vets. Many need help completing minor repairs, or constructing a wheelchair ramp, etc. If you are in the Rockbridge area and want to help, be sure to contact them. You can find Holiday Hearts for Vets through this Facebook link. Or, you may even be inspired to start a similar program in your area! We thank Sandy and Holiday Hearts for Vets for spreading Christmas cheer to our veterans.....What a great example of knowing “the reason for the season” to us all! To learn more about deserving businesses in our “Small Business Spotlight” series, or for tips to help your own small business, be sure to visit my blog and website. We can also connect on Facebook, Google+, Twitter, and LinkedIn! During the every day rush of running your business, it is often easy to overlook those that are working hard to make your company a success. Read on for some great ideas on what you can do to make your employees feel appreciated ~ and remember, even little gestures of thanks can have a great impact! Praise and recognition are essential to an outstanding workplace. People want to be respected and valued for their contribution. Everyone feels the need to know that what they do affects others in a positive way. Everyone feels the need to be recognized and to feel a sense of achievement for work well done (or even for a valiant effort). When employees and their work are valued, their satisfaction and productivity rises, and they are motivated to maintain or improve their good work. As leaders, we have the ability to affect our employees in one of the simplest ways: Appreciation, which can be the difference between motivating a team to new heights and creating a revolving door of turnover at your organization. The cost of a recognition system is quite small, and the benefits are large when implemented effectively. Recognition has shown to lead to measurable improvement in profitability. Measuring the direct impact on profitability is difficult because it is only one of many factors influencing employees in a workplace, but what I have gathered in my research has shown to be profoundly the same across the board. One of the best ways to show how much you appreciate someone is with a hand-written note. Just telling an employee or individual how pleased you are by the work or efforts they’ve done and/or made is sometimes all that's necessary. 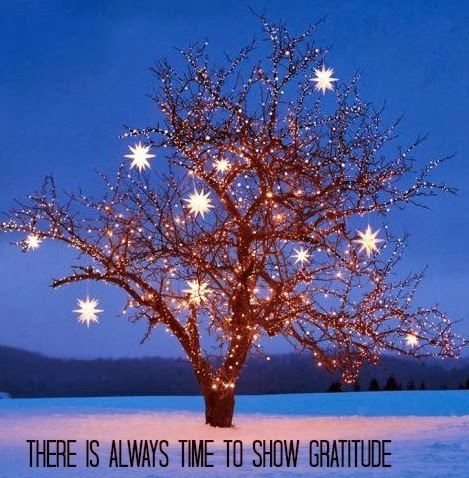 But be mindful of the way in which you're expressing your gratitude. Providing private recognition to a person who prefers public recognition is perfectly fine, but keep in that mind that you have not gained the best value from your effort. On the other hand, if you provide public recognition to someone who prefers private recognition by recognizing them in front of a group, you may create the opposite effect and embarrass them to such a degree that they may become demotivated. One surefire way of making your employees feel your appreciation is by giving them paid time off. Even highly engaged employees still enjoy time off to spend with friends and family. Another time-tested way of saying job well done is bringing in donuts in the morning, pizza for lunch, or dessert for the afternoon. Sometimes the simplest way to show gratitude to your employees is by giving gift cards or bonuses. Better yet, try starting an incentive program where they work to get a specific gift card or cash bonus. Sometimes healthy competition does wonders to a company’s engagement and productivity. Please help us compile a list of ideas with ways in which you show appreciation for your employees and how your appreciation has affected your business! Written by James Moore, Director of Talent Acquisition Services for Excelsior, a Sales and Management Recruiter. For more tips and information to help You with your Small Business, be sure to visit my Website. 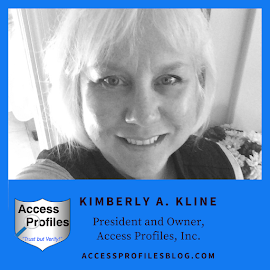 I would also love to connect with you on Facebook, Google+, Twitter, and LinkedIn! 5 Tips to Help You Make the Best “Holiday Hires”! Is Your Business Hiring for the Holidays? Anyone who will be out shopping in the next couple months or so will come in contact with “holiday hires”. These employees are hired on a seasonal basis to keep a company running during this hectic season. 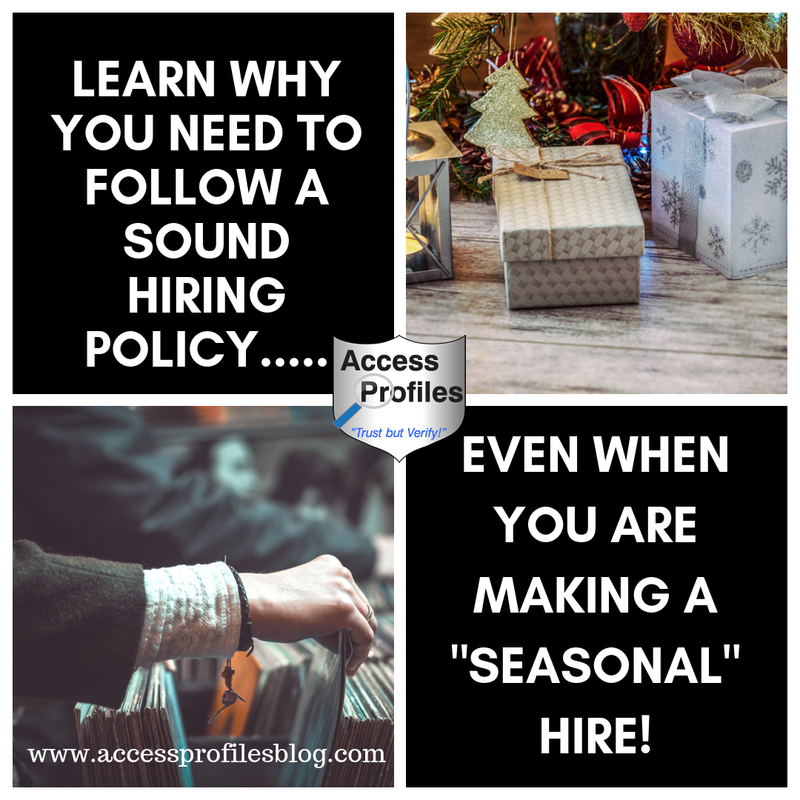 While it may seem that finding and hiring seasonal employees would be an easy task ~ there are definite pitfalls that you need to avoid. 5 Tips to Help You make "Seasonal Hires" in Your Small Business! "Tweet This"
The key to making this hiring process run smoothly? Developing sound guidelines and sticking to them! Going in haphazardly or rushed will only set you up for failure. 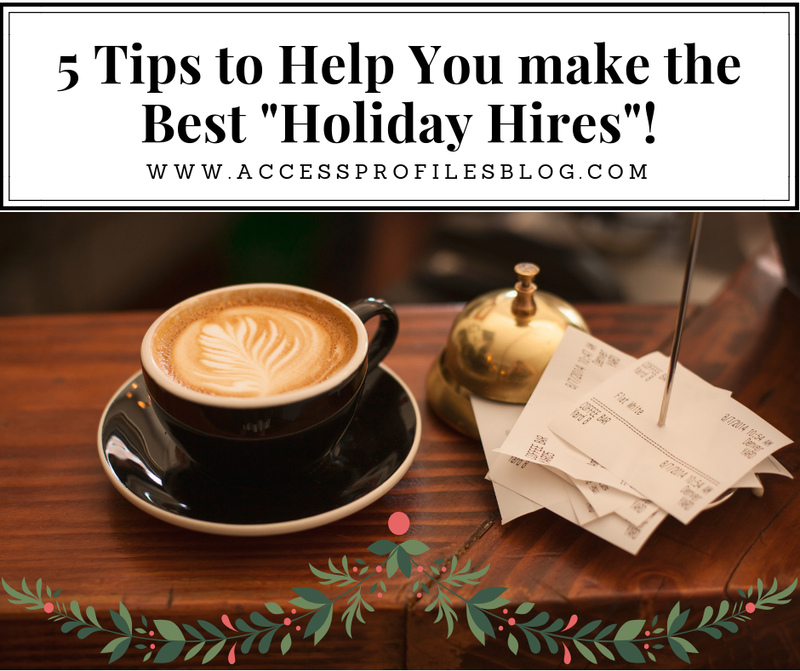 So, when you find yourself in need of Holiday Hires (or any temp employees for that matter), these 5 tips will help you make the best decisions. If at all possible, avoid beginning your seasonal hiring process until the last minute. Giving yourself the time you need to find the best temporary employees will save you a lot of headaches. Even if you find yourself getting a late start, following these other tips can still help you be successful in your quest. If your existing hiring practices are successful, why change them for your temporary hires? Many will argue that the rushed timeframe and pressure to fill your hiring needs justifies cutting corners. I completely disagree. Doing so will only open your company to unnecessary risk. Instead, it is more important than ever for you to maintain your hiring standards. Be sure to follow your usual interview and screening processes to ensure the safety and integrity of your company. Many times, the temporary nature of “seasonal employees” and the heightened sense of urgency fools companies into believing they can skip this step. This is a possibly costly mistake. Unless your hire has worked for you before, omitting the background check can cause you major problems. It is actually more important than ever to make sure your new hire is reliable and trustworthy. Having to worry about whether they will show up on time or is apt to steal from you simply adds more stress to the holiday chaos. That is why checking references and criminal history may actually be more important than ever. Discover more about why using Background Checks makes Sense for Your Small Business, HERE! Don’t forget about temporary workers you have used in holidays past. They are a great pool of talent to fill your needs. You can even tap into the friends and families of your existing employees, college students on break, or retirees. Each of these resources can help you find the seasonal hires you need, and many have the flexible schedules you want. While you may not be able to offer your usual orientation to get your seasonal employees up to speed, you still need to provide a condensed version to make sure your news hires will be ready to step right in. It is important you develop a training plan that focuses on exactly what your holiday hires need to know to be successful. Place special emphasis on working safely, customer service, and following procedures. Remember, even temporary employees are the face of your company. It is crucial to realize they are often the first thing your customers see. A bad impression can leave them with a lasting, negative feeling about you and your company ~ one that will remain long after the holiday rush. Therefore, hiring the best possible should be your ultimate goal. Following these 5 tips will help you make the successful seasonal hires you need. These hires can then turn into a great resource for finding permanent employees. So, doing it right the first time makes sense! Do you have tips for surviving the holiday rush? Please leave them in the comments below. Please Pay it Forward and Share this article on your Favorite Social Networks! Thanks! For more tips and information on Small Business, be sure to check out our About Us, Background Investigation, Business Mentoring, and Security Consulting pages. Learn how API can help You and Your business!